I’ve recently been enjoying Robert Greenberg’s Great Courses video lecture series on “How to Listen To and Understand Great Music.” His method of teaching about significant musical works while also telling stories about their composers – with lots of primary sources, thank you! – has been great fun. Partly inspired by Dr. Greenberg’s style, I decided to write about Andêhostai Erelas, one of my favorite Thomoraii writers. Of course, Andêhostai’s imaginary, but that’s just too bad. I sure do wish his works actually existed. One note – all the marks on the vowels in Thomoraii words and names have meanings. I didn’t put them on just to amuse myself. It was the Golden Age of the emperor Trusǎi in the continent of Thomorai when Andêhostai Erelas was born in 1301 MSY [Modern Sheesania Years; Andêhostai’s birth was in about 1814 A.D. our years]. All of Thomorai was at peace under the rule of Trusǎi, and the middle class was swelling as many people grew rich trading with Unia, Santa Meluna and other nearby countries. The arts were flourishing under the patronage of these wealthy middle and high classes, but most of all under the patronage of Trusǎi himself. The emperor was particularly fond of poetry, and so during his reign he supported many of the best poets in Thomoraii history. At this point there were three main types of Thomoraii poetry. There were the folk poems: rhymes and fables and other such things, passed down by oral tradition and not taken very seriously by the patrons of the arts at this point. Then there were the epic poems, grand sagas of mythological or historical events that focused on telling great stories in beautiful language that would also teach the reader about morality and human nature. These epic poems typically featured archetypal characters and themes and were filled with abstract ideas from philosophy, psychology and other such subjects. They were not supposed to have realistic, complex characters, deal with everyday problems, or teach practical lessons. They were supposed to be grand and sweeping and inspiring rather than down-to-earth, detailed and practical. Then there was the personal poetry, or tuôlenǎ, an art form meant just for the writer. Tuôlenǎ of this time period was typically short but very descriptive and detailed, and involved the specific feelings and ideas of the writer much more than epic poetry. There might be a story to a tuôlenǎ poem, or it might just be a description or a comment. Writers of tuôlenǎ might occasionally show it to friends or family, and indeed many scholarly families kept books of such poems that had been written by members of the family. But in general tuôlenǎ poems were meant only for the poet. Andêhostai Erelas was born in Ôbtobâi, the capital country of the Thomoraii empire, in the golden age of the epic poem. His mother, Fidêl Truwêm, was a singer, and his father, Erelas Pǎityǎr, was a musician who worked for Trusǎi. While Erelas was not a very high-ranking musician among those that Trusǎi hired, he was quite well off and knew many of the musicians, writers and artists that Trusǎi was funding. Erelas intended for his son to become a musician, and so he began giving Andêhostai lessons in all of the major Thomoraii instruments when the boy was four. But while Andêhostai enjoyed studying and playing music, he was not particularly gifted, and Erelas realized that his son could probably never be skilled enough to get a good job in music – there were so many gifted musicians in Thomorai at this point that the competition for patronage was quite intense. So Erelas began casting about for something else for Andêhostai to study. Meanwhile, Andêhostai’s mother Fidêl was teaching him to sing just for their own enjoyment – she liked to write short songs and she thought that it would be very nice to be able to sing duets she had written with her son, and Andêhostai, as mentioned before, enjoyed music despite his lack of natural ability in it. In the course of her teaching, Fidêl taught him bits of epic poems set to music, parts of opera-like dramas that she occasionally performed in. Andêhostai loved these poems and began writing poems and music for them himself, despite the fact that the music he wrote was rather bad. When his father saw the poetry he had written, he told his son to quit writing the music and focus on the poetry, and then he went and got him a teacher to help him. And so Andêhostai started taking lessons in writing epic poems when he was eight years old. I believe that I had practically memorized The Wandering of the Meshobai, The Return of Eriliair, all the works of Dûhǎlas Amjâi, The War for Kafa Monica, all the works of Thesolǎi Kulas, and all the works of Lǐshlai Lǔralai by the time I was fifteen years old. I couldn’t help it; any time I said anything at all about liking one of the poems I was reading, Qǎhai [professor] Bêlûzdâzlai immediately assigned me another reading of it. And then any time I wrote anything good at all about the poem I was reading, he assigned me another reading. And then any time I showed any signs of influence from the poem I was reading in my own poetry, he assigned me another reading. And if for any other reason he decided I needed to read it again – if he thought I had missed something, or misunderstood something, or needed to learn the lesson the author was trying to get across (this happened a great deal when I was a teenager and rather full of myself), or if he was just grumpy that day or if he thought I was grumpy and needed some cheering up – and obviously more reading would do it – he’d assign another reading. I think I read Lǐshlai Lǔralai’s The Call of the Firebird sixteen times in the year I was fourteen alone. Of course, now I return to it quite often for inspiration or just for some relaxing reading, completely on my own initiative. Bêlûzdâzlai drilled the rules of epic poetry writing into Andêhostai, forcing him to revise his poetry again and again. More than anything else, he forced Andêhostai to remove unnecessary words and details. “I had a tremendous tendency to go off on tangents of description at that age,” Andêhostai wrote to Palǎjân, “but Bêlûzdâzlai would have none of it. I would write five pages of a poem and he’d cross out four pages of it, and in the remaining page every third phrase would be crossed out. ‘Unnecessary! Unnecessary! Unnecessary! Focus on your story! Nobody cares what color the banana leaves were!’ he’d say.” Andêhostai did learn a great deal from his teacher. But the disciplined, strictly rule-abiding Bêlûzdâzlai and the dreamy, descriptive Andêhostai very often came into conflict over what was necessary and what was not. One day when Andêhostai was twelve years old, Bêlûzdâzlai happened to mention the genre of tuôlenǎ, dismissing it as a “messy, unorganized, sentimental load of pointless mush with no rules.” Andêhostai had certainly heard about tuôlenǎ before, and had now and then tried his hand at a tuôlenǎ poem or two, but when he heard Bêlûzdâzlai’s rant a lightbulb went on in his head. Tuôlenǎ had no rules! There would be nothing to stop him from going on those descriptive tangents he loved so much! The contrary side of him, the side that always wanted to be different and always wanted to mess with the rules, was delighted. He started filling notebooks with tuôlenǎ poems documenting his feelings, his experiences, his reading and his writing. At first his tuôlenǎ poems were, indeed, messy, unorganized and sentimental without any real form or structure. But as he became more serious about tuôlenǎ, he began to apply what he was learning in his studies with Bêlûzdâzlai to his tuôlenǎ poems, and they became better and better. He became skilled at using small details to evoke a large, rich, image, to illustrate the moods of his characters, and to show people’s emotions in ways that he never could with the stock archetypal characters he worked with in epic poetry. When he was fifteen, Andêhostai wrote a series of tuôlenǎ poems that tell the story of two cousins from a middle-class family. In the beginning, they are walking together through a plantation, discussing their lives. The older cousin tells the younger about how he fell in love with the daughter of a poor farm laborer, a gentle and sweet woman, but with no money or education. Afraid of what his family would think, the cousin married another woman from a middle-class family. As he tells his story to his younger cousin, he tries to convince him, and himself, that he made the right choice. The younger cousin listens, but does not really agree. The scene then shifts to one right out of Andêhostai’s life. The younger cousin is being assigned by his poetry teacher to write a scene for an epic poem on the life of Raǐsh, a great warrior. The younger cousin writes the first stanza of the poem in proper epic form. Then, thinking of his older cousin’s story, he refuses to give in and write in the strict form of an epic poem. Slowly, stanza by stanza, he transforms his epic poem into a tuôlenǎ one, adding more and more descriptive images, more and more details of the characters’ feelings, and breaking the strict phrase structure of an epic poem more and more until it has become a tuôlenǎ poem, free of any particular structure and full of detail and description. It is an amazing work, but Andêhostai did not show it to anyone other than Palǎjân until years later, and it was not published until a few years before his death. But it shows how already, at that age, he had perfected the art of the tuôlenǎ poem and was already experimenting with how he could meld it with the epic genre. When Andêhostai was nineteen, Bêlûzdâzlai finally grudgingly admitted that he had taught Andêhostai everything he could. It was now time for the debut work. Andêhostai would write a full epic poem completely on his own, without any input from Bêlûzdâzlai or anyone else. Once he was finished, he would show it to Bêlûzdâzlai, and if the teacher thought it was good enough, he would organize a time for Andêhostai to perform it for some significant poets and patrons of poetry. Hopefully the poem would be good enough that the patrons would be interested, and then they would bring various proposals for hiring Andêhostai to Bêlûzdâzlai. Bêlûzdâzlai would bargain with the patrons until they had all agreed on a few concrete proposals, which he would then bring to Andêhostai to choose from. Andêhostai chose as his subject the myth of the hero Narâzas. In this classic Thomoraii story, Narâzas accidentally discovers that his father Fezêrlas, who his mother had always said had died before he was born, is actually alive. Narâzas then goes on a journey to find his father, overcoming various trials and making many friends and enemies along the way. But this is just the first part of the myth. At the end of this first part, he finds Fezêrlas, but then at the beginning of the next part, Narâzas discovers that Fezêrlas is actually a traitor aiding an enemy tribe. This is why his mother left his father and why his mother never told Narâzas that his father was alive. So Narâzas then goes on a quest to stop Fezêrlas’s treacherous actions and defeat the enemy tribe once and for all. Naturally, he succeeds, and in the end of the second part he becomes the leader of his tribe and marries a beautiful woman named Surila. There are further parts with more adventures, but Andêhostai’s poem focused on the second part. Now, Andêhostai did want to write a good, solid epic poem. This was, after all, going to be his debut work; it had better be good, or else he would have a hard time ever getting a decent patron. But now that he was not under the critical eye of Bêlûzdâzlai, he wanted to experiment a bit and play with the story and the structure. Most of all, he wanted to incorporate some of his favorite elements of tuôlenǎ: the descriptive details, the emotions, and the fleshed-out characters. So for starters, Andêhostai changed the story a bit. In the original, Narâzas’s bride Surila contributes very little to the story before the marriage in the end; she offers Narâzas some advice once or twice, that’s all. But in Andêhostai’s telling of it, Surila actually dies in the finale of the first part (he begins his poem with the first part’s finale, but other than that he sticks to the second part). Her spirit then returns in the form of a red bird to guide Narâzas in his struggle against his father. Andêhostai and Palǎjân often played with each other when they were children, and Palǎjân sometimes joined Andêhostai’s music lessons with his father and poetry lessons with Bêlûzdâzlai. She read epic poems along with Andêhostai – though she did not read them over quite so many times as Andêhostai did – and she went with Andêhostai and Bêlûzdâzlai to performances of them. Andêhostai often showed her his work for comments and criticism, and they would frequently discuss a writing assignment together to help Andêhostai get his thoughts in order before he actually started writing. When they were both twelve, Palǎjân and her family moved to a plantation in rural Ôbtobâi, and Palǎjân and Andêhostai began exchanging letters. When Andêhostai began to seriously write tuôlenǎ, he occasionally showed her some of his work, and she often suggested improvements or pointed out particularly good bits. They were still frequently writing letters to each other and were still very close friends when Andêhostai began writing his debut work, which he was calling Narâzas and Fezêrlas. But Andêhostai had begun to fall in love with Palǎjân, and when he began Narâzas and Fezêrlas he was trying to decide what to tell her and what to do. Almost unwittingly he began to explore his relationship with Palǎjân through the relationship of Narâzas and Surila in his poem. Surila guides Narâzas but never makes any decisions herself, just as Palǎjân guided Andêhostai in his writing but never wrote anything herself. Surila and Narâzas grow and change throughout the poem, sometimes coming into conflict, but ultimately they support each other even when they disagree, just as it was with Palǎjân and Andêhostai. Most notably, Surila and Narâzas love each other, but the fact that Surila is, in truth, a dead spirit in the form of a bird presents a rather large barrier to their marriage, much like Andêhostai felt that Palǎjân’s opinions towards him and towards love and marriage presented a barrier to them ever being married. Even though he knew that to be true to the spirit of the story he had to keep Surila in her bird form, and he had to make it impossible for her and Narâzas to ever marry, he still struggled with this decision and searched for alternate options throughout the poem. It gives Andêhostai’s Narâzas and Fezêrlas a certain very real quality that is completely lacking in the other epic poems before it. Nazâras and Surila actually struggle with their situation and try to find ways out of it. There is not the foregone conclusion, the ending that everybody knows, that there always is in epic poetry before Narâzas and Fezêrlas. Narâzas and Fezêrlas has a number of other new qualities, too. For one, Andêhostai actually thoroughly fleshed out his central characters: Narâzas, Fezêrlas, Surila and a few others. He gave them realistic emotions; he made the good characters make mistakes; he made the bad characters do good things. Additionally, he filled his poem with descriptions, most often small details to evoke moods and feelings without many words. Such devices were all highly unusual in epic poetry before Andêhostai, and they were all things he had learned to do well in his tuôlenǎ. But these new elements aside, Andêhostai stuck to the traditional form of an epic poem. He kept the basic structure of the myth of Narâzas; he included lofty themes and philosophical ideas; and he was very careful about the sound of his words, one of the key aspects of Thomoraii epic poetry of the time. Light, happy scenes were filled with words that sounded smooth and flowing, making little use of the Thomoraii language’s deep, throaty vowels. But sad, heavy scenes were filled with pharyngealized and epiglottalized vowels and consonant clusters. Happy characters often rhymed or used alliteration; sad characters often used short, choppy words, almost as if they were speaking in between sobs. It might seem rather silly to someone used to English writing, but this was a standard in Thomoraii epic poetry at the time, and Andêhostai did it well. …nothing that much happened, really…I went to his room, held out the manuscript, and said, “Here it is, Qǎhai.” He said, “Thank you, Andêhostai.” He took it, glanced at it, put it onto the stack of papers and books next to him, and looked at me. I knew I was supposed to leave so he could read it in peace. But I could not help but say, “Oh please, Qǎhai, just, if you’re worried, if you don’t know, if you – just keep reading! Just – ” and he cut me off and said, “Of course. You know what I think about how to read an epic poem,” and then he kept looking at me, so I left. But I thought as I was going into the courtyard that his business about reading something three or four times was only for a good epic poem. He also always said that if you realized something was trash, read it for another hour, and if it’s still trash, give it up. Andêhostai finished his short and agitated letter to Palǎjân and sent it, but then he could not find anything else to do as he waited and waited for Bêlûzdâzlai to finish reading his poem. He could not stand to read another epic poem, as he usually did in his free time, since he had been “drowned” in poetry for the last few weeks as he tried to revise quickly, and he was thoroughly sick of it. He tried to practice the instruments he still played, but he was too nervous to play well at all, and, in fact, broke a string on one of them. He replaced the string, and then tried going out for a walk. But he quickly returned home when he saw how hot and sunny it was outside, and besides, he did not want to keep brooding about what Bêlûzdâzlai would think, and a quiet walk would probably encourage brooding. Finally, he decided that since he was already in “such a thin, stretched, crazy state, so nervous of Bêlûzdâzlai that any other stress would seem a relief,” he would accomplish something else that had been a stress on him for some time and would have put him into a thin, stretched, crazy state if he hadn’t already been in one: he would write a marriage proposal to Palǎjân. He was almost done with this second letter to Palǎjân when a servant called him for dinner. Andêhostai, thinking that Bêlûzdâzlai would very likely come and eat with his family, went down to the courtyard where they ate in a “tremendously distracted state.” But Bêlûzdâzlai was not there. He had asked for his dinner to be brought to his room, where he was still reading. Andêhostai desperately questioned the servant who brought Bêlûzdâzlai his meal about what he had seen, but the servant could only shrug and say that Bêlûzdâzlai was looking at papers and seemed just as grumpy as usual. After dinner, Andêhostai returned to his letter to Palǎjân, and once he had finished that, he tried his best to go to sleep. I entered Bêlûzdâzlai’s room and stood there in front of him. He was sitting on the floor with my manuscript in his lap. He had big stacks of papers and books on either side of him. One stack was topped by his dictionary; the other was topped by his [grammar book]…He took a deep breath and said, “Well, my son, I have read your poem. I must say that when I began I was quite alarmed. I’ve known about your…habit” (I could feel the word “bad” perched in his mouth there, passed over but kept ready at hand) “of writing tuôlenǎ for some time, despite what you might think, and I was concerned at first that you had come up with some grand idea about combining the two, epic poetry and tuôlenǎ. And you know what our dear Lǐshlai says about grand ideas” [here is a quote from The Call of the Firebird about pride, one that Bêlûzdâzlai often quoted at Andêhostai when he showed arrogance as a young man] “But…well. Your poem isn’t perfect, you know,” he said, very businesslike and stern all of a sudden, but it made me feel a little glow of warmth…because I know him very well, Palǎjân, and I know that he always does that before he praises me, because he always has to qualify any compliment he makes. That’s just who he is. But anyways, this all flew through my mind in the brief breath before he said, “but…well, then I read this,” and he quoted a piece from near the beginning, a piece that I have very much wanted to show you, Palǎjân, but which I can’t until my performance of the whole thing. Let me just say that it is a piece from the meeting of two friends, but after one has been greatly changed. [It’s from the place where Narâzas first meets Surila in her bird form.] So Bêlûzdâzlai read this piece of my poem to me, and he read it very well, and then he was quiet for a moment, and he said, “My dear son, I have been part of your life for a very long time, and I honestly do not know how you know what such a meeting feels like. But somehow you managed here to push through all my annoyance and alarm and all my fine critical capabilities, all my filters and walls and glasses over my eyes, and echoed something inside me, and so you got inside of me. And my dear Andêhostai, at the end of the day, that is all that matters in art, isn’t it? I don’t care what color the painter uses; if he can make me start and see and realize something in myself, he has done the great thing, he has fulfilled his art. I don’t care what instruments, what forms, what keys and notes and harmonies the composer uses; if his music reaches inside of me, if it gets past my mind and my cold judgment, that is all that matters, isn’t it? Now of course there are colors and instruments and so on that are superior for certain things, and your poem is not all perfect, not at all, and very often it reaches past me and over me and – ” And suddenly, Palǎjân, he leaned forward and bowed his head before me and touched my feet with his hands, and I felt like I was in a dream, and I felt like I was Tebî in Thesolǎi Kulas’s The Quests of Bêkiair and something was being offered me that was too beautiful and too grand and too humbling for the person offering it for me to accept it, and I gasped and said to him, “Please, Qǎhai – !” and then I said, “Tell me what I did wrong!” and he sat back and sighed and said, “I wish I had your [heart].” And then he swallowed and composed himself and began pointing out all the mistakes I had made. It was very thoroughly unsettling, Palǎjân, and I still feel like Tebî when I think of it. I am afraid that he thinks I am better than him at writing poetry. Maybe I know now why you are afraid to write anything. Throughout the rest of Andêhostai’s career, Bêlûzdâzlai would often take issue with the details of how he modified the traditional epic form. But ultimately Bêlûzdâzlai was completely behind Andêhostai’s experimentation, since he believed that Andêhostai had the skill and the talent to pull it off. In the world today, the husband rules over the wife, and the wife has got to scheme and plan and be subtle and clever and manipulative in order to get a word in. I have no desire to be ruled by you or to manipulate you. I have found great joy in our status as equals and I do not want to change it…Very honestly, I don’t care if you say that you would never treat me that way, because even if you don’t want to, everyone around you is going to be expecting it. And even if you are all stubborn and full of grand ideals and ready to take on the world now, are you really going to have the same energy to defy our society twenty or thirty years from now, when you are tired of resisting everything and everyone – including me? Because I am a stubborn women, and I will no doubt frustrate you at times such that you will desperately wish you could order me to stop. And am I going to have the will to defy you when you try to assert your power over me? No. It will not work. We would destroy both ourselves and our happiness….And besides, I am not in love with you, though of course being in love has very little to do with the question of marriage in most cases. But I am just a bit nervous that you think love does have very much to do with marriage, and so if I marry you you’ll expect me to be in love with you. And at the same time, I also feel like Thesolǎi’s Tebî, I feel like the one who is offered something too grand and beautiful, and something that will, in the end, be too painful for the one who offers it for me to accept in good conscience. 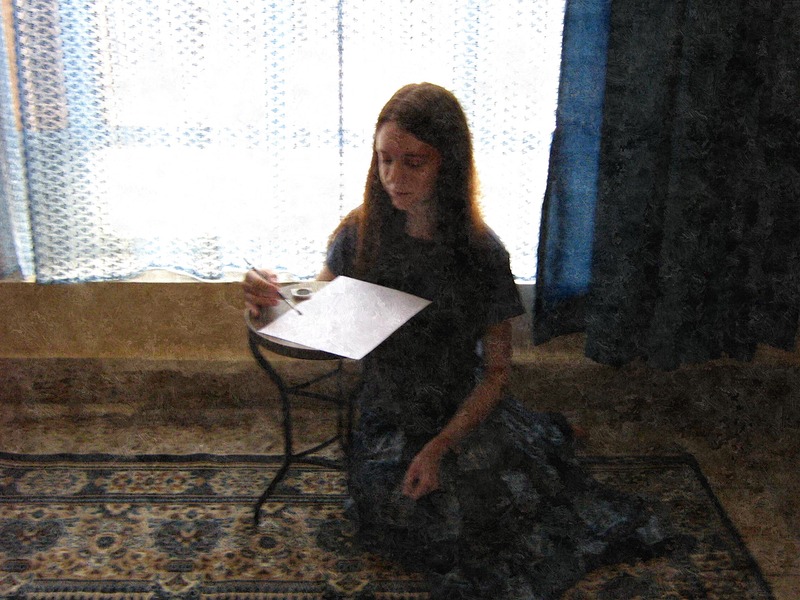 Yes, Tebî did accept in the end, but she was in a story; I am trapped in truth and in reality. Andêhostai acknowledged Palǎjân’s response and withdrew his proposal. But he never really gave up hope of being able to marry her. He was, in fact, married to two other women during his life – Sonolan Alfěslǎi and Fidêl Tělěfes – and Palǎjân herself married another man and had many children with him. But Andêhostai always held out hope, however foolish it might have been, that somehow it would work for the two of them to get married. And those female advisors, so often romantically connected to the hero, but so often unable for some reason to actually be married to him, continued to appear again and again in his work. Five days after presenting his poem to Bêlûzdâzlai, Andêhostai read Narâzas and Fezêrlas aloud in front of an audience of several significant epic poets of the day, including one of his favorite authors, Thesolǎi Kulas. The audience also included some of Ôbtobâi’s greatest patrons of epic poetry; the emperor Trusǎi himself had sent a representative, Kulas Dûhalǎs, to see if Andêhostai was worth his patronage. Additionally, Andêhostai’s family and Palǎjân were in the audience; for them, it was much like attending his graduation. The reading took about four and a half hours. Once it was done, the poets in the audience were split on the merit of Andêhostai’s poem, particularly on the merit of the new, tuôlenǎ-like elements that he included. But the patrons loved it, and by that evening, Bêlûzdâzlai had quite a number of proposals from them to present to Andêhostai. Andêhostai ended up writing a poem on the foundation of Obtobian civilization for an army general, and a poem called The Death of Numiair, based on an old myth, for the head of the Thomoraii government’s tax department. When Trusǎi’s representative Kulas Dûhalǎs read these poems, he finally decided that Andêhostai’s work was mature enough to deserve Trusǎi’s patronage. Two years after Andêhostai’s debut reading of Narâzas and Fezêrlas, Trusǎi hired him to write a trilogy of epic poems on a mythological topic “to be decided.” The resulting works were the three volumes of Andêhostai’s classic Bêkiair Cycle: Bêkiair and Tebî, The Wanderings of Bêkiair, and Bêkiair and Kedê’a. After reading these phenomenal works, Trusǎi decided to hire Andêhostai for life. Andêhostai continued to work on perfecting his synthesis of epic poetry and tûolenǎ until he died. At first his style was quite controversial, with some critics loving it and many others citing it as an example of the sloppiness of modern writers. But as his work became more polished and his style lost some of its alarming novelty, the critics of his day mostly settled into praise, though of course there were still quite a few that hated his writing. The patrons and readers of epic poetry, on the other hand, almost all loved it from the beginning. Printings of his poems were bestsellers, and readings of them sold out. His wife Sonolan Alfěslǎi set several of his poems to music, starting with The Death of Numiair four years after it was published, and the resulting works were also quite popular. Additionally, his Bêkiair Cycle was adapted into a opera-like music-and-drama production five years after it was first published, and this work remains a classic of Thomoraii theater today. Much more notably, Andêhostai’s style was a huge influence on the younger epic poets of the day. They loved his way of writing description, his complex characters, and his liberal use of emotion. Expanding on this, they began to write epic poems that were not based on historical or mythological tales. One writer, Amjâi Bêlûzdâz, wrote many poems telling stories he had completely made up himself, set in the time when he lived, featuring normal middle-class characters – very unusual among the hordes of gods, nobles, warriors and peasants that filled the old Thomoraii epics. Other writers began to include more practical morals and ideas instead of just the rather grand philosophical theories that earlier epic poems were filled with. And, most of all, there was a new focus on complex and realistic characters. Old heroes and villains were reimagined with more sophisticated motivations, personalities and moralities, and many new heroes and villains were created, too. Through his skilled combination of epic poetry and tûolenǎ in his beautiful works, Andêhostai Erelas started a trend towards humanistic realism in Thomoraii poetry. His focus on the details of life, human experience, and human emotion struck a chord with his readers and inspired many future Thomoraii poets. Today his work is some of the most classic in the Thomoraii literary canon; The Death of Numiair and the Bêkiair Cycle, in particular, are very famous and are required reading for many students. Now Thomorai’s future poets read Andêhostai over and over again just as he once read the classics of his day over and over. This example text, translated into my imaginary language Lukokish, is part of the first scene from Usëvzan îars irlïrz, a classic Lukokish mejëiç novel written by Têla Öete in 1362 (139 years ago from the present, so comparable to something written in 1874). The mejëiç novel, a uniquely Lukokish invention, is composed of dialog and audible speech alone. There is no prose description or narration, no explanation of who’s talking, no record of what people are thinking – nothing except dialog spoken aloud. Mejëiç novels are usually printed with speech by different people in different colors. But still, it is a challenge for the author of such a novel to effectively convey who’s speaking, let alone a whole story! This particular example lets me show the style of Lukokish novels, while also showing how both high-class Jaeve and low-class peasants would talk. Usëvzan îars irlïrz, usually translated as Oaths and Lies (though a more accurate translation would Making Oaths and Then Lying), is a good example of a typical classic Lukokish novel. It focuses on a Jaeve man (the Jaeve are the nobility of Lukok) and what he does to save his family’s honor, while also pursuing love and a place in life. Many of its features, including love between Jaeve and non-Jaeve, honor of a family, conflict between Reason and Beauty (in this case epitomized by the two lead characters), coincidences conveniently explained by divine favor, etc. are traditional Lukokish themes. But it also includes more modern elements, which were beginning to be introduced in Lukokish literature in the mid-1300s. Peasant revolts, which only truly began around this time period, figure prominently into the story. The government’s new regulations are also important. Additionally, one of the central characters is tremendously deceptive, with the author even intending to have him deceive the reader! Having such an unreliable main character was unusual in Lukokish literature when Têla Öete wrote this book. Têla Öete, like most Lukokish writers, was Jaeve. She came from the Öete family, who were fairly rich and had lands in central Lukok, so they were close to the capital Nêleru. For this reason, Têla was familiar with what was going on in Lukok, since she would hear news from the capital. Hearing of peasant revolts and related problems probably helped inspire Usëvzan îars irlïrz. Têla wrote eight published novels, six of which were mejëiç. This one was her third published story. All of her mejëiç novels were quite popular, as this genre was becoming more fashionable during this time period, but her normal novels were not well known. Today, Têla’s work is still popular among mejëiç enthusiasts, particularly because very few Lukokish writers are producing novels of this genre anymore. I first wrote this scene’s English translation, then translated it back into Lukokish, making adjustments to the English as necessary – I do not flatter myself that I can write a story in straight Lukokish! I also wrote a detailed interlinear and literal translation, so you can see some of the unique ways that Lukokish expresses things. Finally, I’ve added many extra notes to explain important concepts or implications, note literary techniques, and point out particularly interesting language uses. However, there are still many quirks of speech that I didn’t point out – look at the interlinear/literal translation to see more. Also, please don’t feel like you have to read all the notes 😉 You can certainly understand the story, at least the basic idea of it, without looking at the notes. 1 Remë’s wording of “who’s there,” eà ävnë, literally means “what thing?” and reveals his lack of education. An educated Lukokish person would say ötò ävnë di? “what person exists?”, avoiding the use of a sentence fragment, and also keeping from potentially offending the listener by referring to him or her with the dummy noun. These kinds of small differences in speech are generally very important in mejëiç novels. 2 A Lukokish reader can get a great deal of information from this name alone! First of all, Lumëan uses the title âle, a third-person term of address, in order to refer to himself. Âle would usually not carry honorific connotations, but since it’s in the third person despite the fact that Lumëan is talking about himself, it means “lord.” At the same time, it is quite humble, since a lord would usually be referred to, and would usually refer to himself, with the honorific third-person term ulùr. So from this one word, Lukokish readers can tell that Lumëan is a lord, but is being unusually humble, also taking into consideration the fact that Remë must be low-class (they’d know this from his use of eà ävnë). Secondly, Lumëan is clearly male, since -ëan is a male gender postfix. Finally, Lumëan’s surname Töreşv is important. It is a surname belonging to one of the 21 noble Jaeve families, so we know that Lumëan is Jaeve (though he is already almost certainly Jaeve if he is a lord). Also, we can guess that Lumëan lives somewhere around Sètsol, because this is the hometown of the Töreşv. Since the Töreşv were at this point a fairly prestigious but rather poor noble family, we can also guess that Lumëan probably has a lot of pride in his family but not much money or power. Additionally, the Töreşv had ties with Laguina, so he has a higher possibility of being under suspicion for treason – something that will come into play later in the story. As you can see, for a Lukokish author, choosing the right family for a Jaeve character is very important! 3 More sentence fragments on the part of Remë, further demonstrating his low social class and level of education. High-class and/or educated people still use sentence fragments in conversation, but they would certainly be more careful when talking to somebody above them, as Remë is doing. Also, it is unusual for anybody educated to give a command without making clear who they are speaking to, as Remë is doing. 4 The name Remë Ränolet confirms any remaining doubts the reader might have about his social class. Remë is a name meaning “egg,” and it is quite common among peasants but rare in higher-class circles. Ränolet is a common low-class surname. All in all, Remë has a rather bland, generic peasant’s name. 6 Note the Lukokish phrase for “please,” nmet di. It is composed of a noun that has lost all other meaning, nm, and a d* that carries the meaning of “please.” If you were asking for a future favor, for example, if Lumëan was asking Remë to talk with him tomorrow, you would use d* in a soon or future tense. 7Note Lumëan’s multiple uses of verb conjunctions. Uneducated Lukokish speakers still use these conjunctions, but they are more common in the mouths of educated speakers. 8Meön meşïksmä “it is late at night” is literally “night is far to the right,” since time in Lukokish goes from left to right. 9Again, a great deal is communicated by how Lumëan addresses Remë. He uses a normal second-person address, muïr, which does not imply any particular honor, but he uses Remë’s surname afterwards, which does. A lord would usually speak to his vassal with muïr alone, or with muïr accompanied by the peasant’s first name. In this way, Lumëan is treating Remë with more honor than a lord usually would, but he is certainly still not going all-out – Lumëan retains his pride despite his desperation. 11Note that Remë doesn’t inflect ûrëmä “foolish,” further evidence of his lack of education. He also calls Lumëan a boy, which is a bit of an insult since Lumëan is an adult (if a young one). 12 Note the metaphor Lumëan uses in the Lukokish: they both know this fact tall-ly. By Lukokish thinking, knowledge and understanding stacks up, so if you have a lot of knowledge or understand a fact very well, it’s tall. 13 Another metaphor: “drawing a circle around something” for “keeping control.” To Lukokish, control is much like encircling or surrounding something. 14First of all, Lumëan must be at least 18 to become lord, since this is the age of legal adulthood in Lukok. (Okay, I know that looks like I just borrowed that age from the American system, but there’s a reason why it’s 18! You see, the Lukokish use a base-6 number system, and 18 would be represented as 30 – a nice, even number. That’s why. By the way, that’s the legal age of adulthood – who people informally consider an adult varies from place to place and social class to social class in Lukok. Some give ages as low as 14; the highest age is 24, another even number in base-6.) Secondly, now the reader would know why Lumëan is feeling desperate (even without being aware of further reasons that are revealed later on), because a lord would be in a dire situation if his peasants threw him out. Not only would he not be able to earn a living, he would bring shame to himself and his family. Lumëan is especially vulnerable because he is young and unestablished. In addition, again, Lumëan frequently uses verb conjunctions. Finally, note his use of the past tense to relate this episode: it perfectly shows his status as a Jaeve, but a lower-status one. Jaeve usually use past tense (as opposed to recent tense) only for long-ago or historical events, and the lower class a Lukokish speaker gets, the more likely they are to use past tense for less long-ago or historical events. Lumëan uses this tense for his deposition and the events leading up to it, which are historical for him…but higher-class Jaeve would consider them minor enough for recent tense. 15 Literally “for the purpose of foolishness” – Remë is insulting Lumëan’s idea more than anything else here. It is a common expression with Remë throughout the story, as he is always criticizing things. It is also fairly common in the mouth of his daughter, Tïma, whom Lumëan will soon reveal that he is in love with. This is just one indication of how Tïma shares many personality traits with her father – interesting, because while Lumëan loves Tïma’s personality, he is always at odds with her father! These sorts of paradoxes go unquestioned in most classic Lukokish novels, but in Usëvzan îars irlïrz, Têla Öete went a bit out of the box and had her characters actually discuss the problem of Lumëan appreciating Tïma but not Remë. 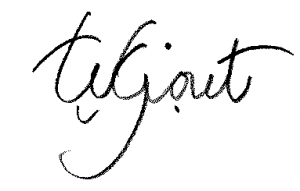 This is just one of the small, innovative twists that made Têla Öete such a popular writer. 16 Literally “your father gave you words.” This has a stronger meaning than just “your father trained you” – it means that Lumëan’s father shaped his worldview and way of thinking and speaking. 17 It is rather impolite for Remë to address Lumëan with his straight name, even his full name, without using any titles. Even friends will usually use titles when directly addressing each other, and they certainly would if they were having as important a conversation as Lumëan and Remë are! 18 This comment shows just how much Remë doesn’t understand the life and responsibilities of a young Jaeve man, particularly one with four sisters, as Lumëan is later revealed to have. The fact is that Lumëan was obligated to serve as lord, and even if he couldn’t do this, he would have to provide for his sisters somehow, and even if he didn’t have sisters, he would still have to pursue a respectable Jaeve occupation – he could never just do whatever he wanted unless he wanted to bring shame upon himself and his family. Lukokish peasants, on the other hand, are generally much freer. They still have obligations of maintaining the family honor, but this mostly consists of not becoming criminal, immoral or extremely poor. 19 Lumëan, on the other hand, knows perfectly well that he can’t do what he wants, and in frustration appeals to God to see the sorry state of the world and save it. Keşundûjï is a frequent exclamation with Lukokish facing trouble or seeing problems in the world, as he is. 20 Literally, “the heirship grasps me tightly.” To Lukokish, duty holds and restricts, but do note that this is generally not considered bad – many writers argue that duty is necessary for restricting the wildness of emotions and will, and that the limitations it imposes are helpful for self-control and happiness (because, after all, you can’t have everything anyways). 21 Look at the interlinear to get a better feeling for the different familial terms Lumëan uses. He must use two different terms for “cousins,” one for those on his mother’s side and one for those on his father’s side, as Lukokish distinguishes between most relatives on the two sides. But there is just one term for “nephews and nieces” – one of the family roles where relation to the father or mother is not distinguished. 23 This is completely true, even as it shows the more individualistic focus of the lower classes. Remë is full of such truthful, critical and pointed observations. He is not always understanding, careful or polite, but he is shrewd and not easily fooled by flattery or nice manners. These are all traits he shares with Lumëan’s love Tïma (though Tïma, admittedly, is generally a bit more diplomatic). Lumëan, on the other hand, is rather dreamy and tends to see things more poetically than they really are. Many non-Lukokish critics have complained that people with such disparate personalities as Lumëan and Tïma could never get along so well. But the fact is that the union of poetic dreaminess and sharp observation of fact is a huge motif in Lukokish literature, because it’s supposed to represent the harmony of Reason and Beauty. According to one Lukokish critic, Nazëan Viru:, more than half of Lukokish literature deals in some way with conflict and harmony of Reason and Beauty. Usëvzan îars irlïrz, with Tïma representing Reason and Lumëan representing Beauty, is among this body of literature. 24 Literally, “God knows that is not my heaviest thought!” In Lukokish metaphor, heavy thoughts are more memorable and present, while light thoughts are easily forgotten. 25 Literally, “I have said my first line.” In Lukokish metaphor, an argument is a drawing, and a point in an argument is a line. 26 Lumëan uses the more colloquial and less high-class expression de:me de:me here to say “X but Y yet Z” (de:me X de:me Y de:me de:me Z). He is becoming less and less careful and slipping more into colloquial speech as he becomes more agitated, probably especially because he is about to declare his love for Tïma. 27 As things stand now, this story would appear to the reader as a (most likely appealing) mixture of old tropes and newer elements. Lumëan is an almost textbook young and dreamy, yet honorable symbol of Beauty, an image that will be further enhanced by his declaration of love. Remë is a bit more interesting with his bold insults and sharp criticisms. But after discovering in the next section that he had tried to protect his daughter by not allowing her and Lumëan to marry, readers would probably write him off as a typical restrictive-out-of-worry father type. The whole idea of peasants rebelling against their Jaeve lord, on the other hand, especially with the added twist of the lord then trying to negotiate with his vassals, would be quite novel. Considering the rest of the book, both Lumëan and Remë end up being a lot more fleshed-out and interesting. After this initial setup, the story skips forward ten years to find Lumëan as a broken and disillusioned wanderer, shadowed by a enigmatic and deceptive magician sidekick, Dimenç, whom he trusts utterly. (Much of Lumëan’s inner conflict has to do with regaining his true sense of Beauty, while avoiding the twisted and ugly side of Beauty represented by Dimenç.) Before this jump ahead in time, Remë and Tïma have several interactions, showing how much Tïma, despite Lumëan’s aversion to him, loves, respects and takes after her father. Then, after the jump, Remë is dead, but Tïma so often refers to him or acts like him, and Lumëan’s reminisces to Dimenç so often include him, that he continues to be important. All this reveals him to be a shrewd thinker and a loving parent and husband. “Âle Lumëan Töreşv meà kîdi. title.male.ACC Lumëan Töreşv def.NOM-dummy.noun be-d*.pres. Lord Lumëan Töreşv the thing is. To you my mouth must talk! what, def.NOM-you.male again-adv? d*.pres-imp.cont-away go I-def.COM! What, you again? Be going away, I command! “Remë Ränolet, ditrè çê, dvîr evè divël vlël, nmet di! Remë Ränolet, d*.pres-stop go, and.share.sub def.ACC-I d*.pres-back.to talk, please d*.pres! Remë Ränolet, stop, and listen to me, please! dvîr nïvet dös vlël meşanenäska! vconj.subject def.DAT-you.male d*.pres.could talk very.pres-should-adv! and to you must talk! Ataï ma idàdçe mevè dêsek vlël äîre atà kïnïçe dêçë. indef.ACC-dummy.nouns two only-indef.ACC def.NOM-me d*.soon-down talk vconj.verb indef.ACC-dummy.noun more-indef.ACC d*.soon-away. Two things only I will state and a thing more ask. Please, you come out, me your mouth talk to! “Nïvet meçèt dö, diçë çê veşrè! def.DAT-you.male def.NOM-mouth-my d*.recently, d*.pres-away go I-def.COM! You my mouth told, go away I command! def.NOM-night very.pres-right-def.NOM, indef.ACC-talking def.NOM-time this for-def.NOM-pres.neg! The night is far to the right, talking this time is not for! title.you.male.sub Ränolet, please-my d*.pres, God for.the.purpose.of-def.POSTP.verbal, d*.pres-towards go, def.DAT-me def.NOM-mouth-your.male d*.pres! Mr. Ränolet, please, for the purpose of God, come out, to me your mouth speak! de:me atd mevè dë kovèt vävôik mejëv dekèt. but indef.ACC-act def.NOM-me d*.soon.subcls def.POSTP.verbal-you.male for-def.POSTP.verbal def.NOM-brain-your.male d*.pres.neg-up. but that I will soon do something for you, your brain do not think. “Muïr Ränolet, eàet skuìd kîesöst mevèt di eveëm neseäds szûr mevè neseäds. title.you.male.sub Ränolet, def.ACC-dummy.noun-my indef.POSTP.acc-one of-indef.POSTP.acc def.NOM-you.male d*.pres know tall-COMP.equal vconj.object.d*.verb def.NOM-me tall-comp.equal. Mr. Ränolet, the first thing you know as tall-ly as I know it tall-ly. de:me dvîr elëv dös de asemerşz. but it I cannot draw a circle around. de:me ezl meevë sëukeëntmä kêvöt êaltëa, ezl nïevë mevöt durê işiz. but he was stern to you, so him you obeyed. because def.NOM-me pres-gentle-def.NOM pres-young-def.NOM vconj.subject def.ACC-you.pl d*.pres.could d*.past d*.recent.neg-down do.something. because I am gentle and young and you I could not stop. “Ta mevet sekkarmä! Kiûne:rë vävok! Because you are gentle! For the purpose of foolishness! ezl eevë mevet kîdë mevïl ëäns dukë eveëm. so def.ACC-him def.NOM-you.male be-d*.soon.subcls def.NOM-we.exclu all d*.past-imp.ongoing. so him you will be we all knew. besides, def.NOM-him young-def.NOM! indef.PREP-road def.POSS-you.male indef.PREP.verb-on def.NOM-foot-your.male d*.pres.could. Besides, you’re young! On a road of your own your foot can walk. Road of my own…God save us! Aissë, merêekomëv di – de:me eulùr meve kîdi, de:me esan ärv meve dös de asemerşz. Well, your ear listen – the lord I am, but this place I cannot draw a circle around. ta dvîr enivöçë kîdi eve menivöçëzis di oman. because vconj.subject def.ACC-heir be-d*.pres def.ACC-me def.NOM-heirship d*.pres grasp.tightly. because the heir I am, me the heirship grasps tightly. if.then vconj.sub indef.ACC-shame def.POSS-sisters-my, def.POSS-mother.side.cousins-my, def.POSS-father.side.cousins-my, def.POSS-nephew.or.nieces-my – def.POSS-Töreşv d*.pres.hypo create! then you a shame of my sisters, my cousins on my mother’s side, my cousins on my father’s side, my nephews and nieces – the Töreşv would create! d*.pres.hypo, indef.ACC-shame def.POSS-you.male, def.NOM-mouth-your.male d*.pres.subcls def.NOM-brain d*.recent-stop! Yes, a shame of you, your mouth mentioning your brain forgets! “Eşaet mejölat mejâk ëmäv kîdöv Keşun di eveëm! indef.comp.ACC-dummy.noun-my very.recent-heavy-indef.comp.ACC def.NOM-thought that be-d*.pres.subcls.neg God d*.pres know! That that thought of mine was not recently heavy, God knows! – Aissë mesmëv di, edoka idlo meç dö. Well your eye see, the first line my mouth said. de:me de:me nîërz dâr meşanenäska kodïn kermetêrezet vävôik. but but vconj.sub.obj.vb d*.pres.hypo pres.very-must-ADV def.verb.POSTP-honor def.POSS-family-my for-def.verb.POSTP. but must do that for the purpose of the honor of my family. Edokaet metlo meve dê joserëur…. The second line I am just about to draw…. …or rather, the country of the Independent Republic of the Union of Muhiiwuh (moo-hee-WOOH), which is made up of various culturally and/or racially related islands located near the continent of Lukok. (If you look closely and think carefully you may notice a subtle reference to a popular Wii game, which was actually the original inspiration for two of the islands.) This country was formed very recently, mostly by the efforts of the people of one of the islands, Muhiiwuh. All of these islands had been controlled by Lukok for centuries, and Muhiiwuh in particular had actually been completely sold to a businessman. You see, the original inhabitants of Muhiiwuh, and many of the other islands, were not actually human. They were Muhiis, which are very similar to humans, but are slightly shorter and smaller, have simpler features, and tend to be neither skinny nor fat, but somewhere in between. Muhiis are just as intelligent as humans, and they are closely related enough that a Muhii and a human can have children together. The modern-day residents of Muhiiwuh almost all have Muhii blood, but are very rarely pure Muhii, if at all (there is no known reliable way to test if somebody is pure Muhii). Well, you see, because these Muhiis were not actually human, the Lukokish government figured that it was a good excuse for not treating them as well as they would people. So the government sold Muhiiwuh and a nearby island, Spearpoint Island, to a businessman named Thomas Wagoneer for a very large amount of money. Thomas Wagoneer was eager to buy these islands because Muhiiwuh had a very popular and profitable resort…which was unfortunately owned by Muhiis, meaning that once Mr. Wagoneer had the land, he could do whatever he wanted with the resort. This was because Muhiis could not be legally recognized as owners of land or businesses, not being human, and Mr. Wagoneer had been licensed by the Lukokish government to do whatever he wanted with the Muhiis anyways. So for years and years, the Muhiis suffered under the reign of Thomas Wagoneer, who treated them all as his personal servants. Meanwhile, a Muhii archaeologist named Lawrence Walsey (he hated the name Lawrence, though, so he had people call him L. Walsey) was uncovering amazing monuments and tunnels that had been built by the ancient Muhiis, before they were in contact with humans. Thomas Wagoneer was now in a pickle. Should he allow the excavations to go on, as tourists would surely come to see the monuments, and therefore provide him with more profit? Or would these tourists see the impressive monuments and begin to wonder about the fairness of the treatment of the modern-day Muhiis, the descendants of the monument builders? Thomas Wagoneer decided to play it safe and ordered the excavations to stop. L. Walsey was devastated, but he continued to study the artifacts and buildings he had uncovered, and, more importantly, he told all the Muhiis about his findings and got them very excited about them. He especially got the children interested in his discoveries, and this ended up being Muhiiwuh’s salvation. These children then went off to college in other countries, as there were no colleges in Muhiiwuh, and many of them were smart enough to get scholarships in colleges outside of Lukok. In these countries, they spread the word about the Muhii monuments and got the Sheesanian scientific community very interested in them as well. And so when these Sheesanian scientists heard that Thomas Wagoneer had ordered the excavations to stop, they were furious. So these scientists began to pester Thomas Wagoneer about allowing the excavations to go on again, and when he continued to resist, the scientists made a major international ruckus about it. And then when it was discovered – by the Muhiis – that Thomas Wagoneer was corrupt, the Lukokish government threw him out and took over Muhiiwuh and Spearpoint Island again. (Lukok had no problem at all with Mr. Wagoneer – after all, he had been paying big bribes to them – but so their international reputation wouldn’t get damaged, they had to punish him.) Now that the Muhiis already had a lot of international attention, they began campaigning for a free and independent Muhiiwuh. Several of the nearby Muhii-related islands joined the campaign, too. These islands won a victory when the World Union, Sheesania’s international governing body, allowed a Muhii to represent his islands in the World Union. However, they still did not have the full position of a Minister in the World Union – you see, when a country is disputed, the World Union allows in a representative, who has much less power than a full-fledged Minister, who is from a mostly undisputed country. For a country to be considered undisputed by the World Union, two thirds of the Ministers in the World Union have to vote it to be so. The Muhii countries went on for a while with only a representative, continuing to fight for independence with limited success until Zethra Dūsti became World Minister (the head of the World Union). Zethra was from Mirztieken, a large island in the same continent as the Muhii islands, and he was already well acquainted with the Muhii independence movement. 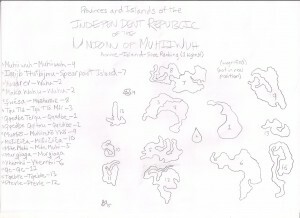 With his support as World Minister, the World Union finally voted to allow Muhiiwuh and 14 other islands to enter the World Union as the Independent Republic of the Union of Muhiiwuh. 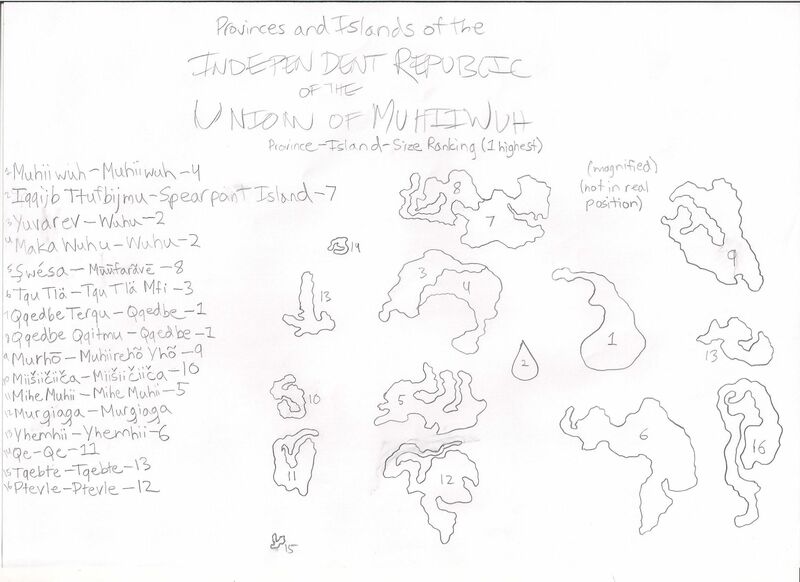 Here’s a map of the various Muhii islands (not how they are placed in proximity to each other, however). I’ve only made up much about Muhiiwuh, which is a small but beautiful island that has become famous not only for its monuments and the independence movement, but also for its excellent resort! I haven’t given an actual date to these events, but it was sometime early in Sheesania’s history. A long time ago, in a small island country called Mirztieken, there was a great tribe called the Aved. The members of this tribe lived all over the island, from the great northern mountain ranges, to the wooded hills and plains in the south. But while they were all united, there were two distinct parts of the tribe: the Sohdi and the Tivrin. The Sohdi lived in the northern mountain ranges; the Tivrin lived in the southern lands. They spoke the same language, and had the same customs, but for some reason they had split themselves up into two groups with a larger group. Many, many miles away, across a large and dangerous ocean, there was another tribe. This tribe lived on what was called the Batri Coast, so they were known as the Batri. However, the Batri were not enjoying the same peace as the Aved were. A few rebels had begun to question the power of the supreme Batri king, and it was causing problems. A lot of problems. Neighbors got into fights, families split up in arguments, land was stolen, and worst of all, the king’s laws were openly disobeyed. So the king said that the rebels and their leader, Mir, had to leave. As the king had a bigger army than Mir and his followers, they decided to avoid a civil war and move away from the Batri Coast. Now one of the Mirz was a trader named Dusti. He had gone up and down the Batri Coast in many different ships, buying wares from the northern Batri and selling it to the southerners. As a sailor, he had heard many stories of what lay across the ocean, and so he suggested to Mir that they try a sea voyage. Dusti pointed out that nearly all of the legends implied that there were islands not too far off the Coast, and that they were mostly uninhabited. So why not try? They would die anyways if they stayed around too long! Mir grudgingly agreed, and got his people together to go on the trip. He had Dusti buy a large ship that should carry all of them, but when he discovered that a big enough ship would be too expensive, he bought a smaller one and stuffed everyone inside. Dusti warned him that this wasn’t a good idea, but Mir wasn’t exactly the most teachable, so he ignored the merchant. The voyage was rather unpleasant. Almost none of the Mirz knew how to sail a ship, they were cramped, there was too little food, and nobody had any idea where these mysterious islands could be. So while Dusti ran around all day and night trying to teach people how to drive the ship, Mir spent most of his time lazing around, insisting that he was sick. Dusti was not pleased, but he had sworn allegiance to Mir when he had joined the rebels, so he had no choice but to obey him. Many, many miserable months later, Dusti got up early one morning to watch for land yet again. But this time he saw something. Up ahead, if his eyes weren’t tricking him, he saw a faint line of green that meant solid ground! “Tieken! Tieken!” he yelled, which was “land” in the Batri language. Everyone was overjoyed that their voyage had finally come to an end – or so they thought. They landed at the green line, which unfortunately turned out to be a marshy, muggy, wet, soggy land with no dry ground, period. Though everyone was glad to be on land again – it could hardly be called solidland, though – Mir was angry at Dusti for “leading them to this horrible place”. Dusti, who almost never got angry, pointed out coolly that perhaps not all of the island was an inhabitable marsh, and anyways they had managed to find it! So Mir grudgingly allowed Dusti to pilot the ship on an exploration trip down the coast. The Mirz went on for quite a while before a sharp-eyed five-year-old named Brilka spotted a green, wooded coast that – wonder of wonders – didn’t look marshy! When Dusti landed and discovered that it was green, beautiful, and dry, he named it Brilka Point and suggested to Mir that they settle down there. Mir, who was very eager to stop their wanderings, agreed. And so the Mirz came to their new home, which they called Mirztieken – “Mirz land”. But this is not the end of their story. Oh, no. There was still much to come. Now the Aved (remember them? the great tribe that lived all over the island?) did not leave anything unnoticed for long, and so they soon discovered the scraggly settlement of refugees that had taken over their forest point. The Tivrin, who lived nearby, were friendly to the newcomers and helped them as best they could. Soon the Mirz learned the Avedi language and the Aved learned the Mirz language, Mirz women married Aved men and Aved women married Mirz men, and everything was friendly and happy. However, the Sohdi were not so excited about these “intruders”. They were afraid that the Batri king would come after the Mirz to punish them (though if they had spoken to the Mirz about this, they would’ve come away with the definite answer that he would certainly not). And besides this, they were very protective of not only their country but also their customs, their language, and all the other things that made them unique. 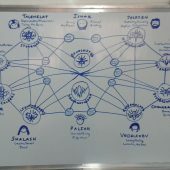 So they warned the Tivrin to not be so friendly with the Mirz, and actually went as far as to try to break up some relationships between the Mirz and Tivrin. Time went on. No wars flared up, but there were a few skirmishes. The Tivrin and the Mirz blended into one, and the Sohdi drew away from them. Soon the great Aved tribe was no longer one big united group, and there were two tribes living together on the island. The Tivrin/Mirz still referred to themselves as the Aved, but the Sohdi began to call themselves the Sohdi instead of the Aved. The united had split. War had not come yet. But…Well, that is another story. This is set in the country of Oriansia, around the time that King Napios, King Ebert, and King Rebert had their reigns in Sengoria. Sijilak never expected to be king. He never even wanted to be king. Indeed, he rather didn’t want to. And he might have ended up not ruling Oriansia if it wasn’t for his wife, Alsia the dolphin trainer, who was a peasant and a foreigner. If he hadn’t ruled Oriansia, then perhaps King Rebert would have never conquered Oriansia, and then he would have never been overthrown. At which King Amisos, one of Sheesania’s best kings, would have never come to the throne, and then…So basically, if it wasn’t for Queen Alsia, then much of the progress that went on during the next seven decades would have never happened. And while Sijilak is often credited for this, it was really his wife that drove him to do all he did. Plus she raised his son, Sneppe, who was to have a massive effect on world affairs for quite a while. Sijilak was the third oldest son of King Oferte, a softhearted but usually firm ruler. His eldest son, Toldone, was expected to become king. If Toldone somehow didn’t survive, then the second oldest son Atatef would be king. Sijilak did not think at all that he would ever need to rule Oriansia. So he married a peasant girl, 18-year-old Alsia Vaneje, who was relatively famous for training and performing shows with her dolphin, Elmeaux. One day Toldone and Atatef were hunting together when they came upon a notorious robber band known as the Trudje. The robbers captured the two princes and held them for ransom. King Oferte’s general suggested attacking the band, as it would be relatively easy to take back the two young men by force, but Oferte declined. He thought that it would be too tricky to find the hiding place of the Trudje. So they payed the ransom and expected Toldone and Atatef to be returned. Unfortunately the Trudje were not about to do so. Seeing that King Oferte was quick to give them money, they charged a little more. And a little more. And a little more. So finally the King, in frustration, sent out his army to capture and kill the Trudje and find the princes. But the bandits found out what was happening, and quickly killed the princes. Then the army came upon them and punished them severely. Suddenly Sijilak was the heir to the throne! He was living in a little cottage near the sea with Alsia and their two daughters. Alsia was out training her dolphin Elmeaux along with her children when a messenger arrived. Sijilak was so alarmed at the news that he immediately saddled a horse and set off for the capital to plead for someone else to be proclaimed heir. However, Alsia was a bit too quick for him. As soon as she discovered what her husband had done, she also set off for the capital, planning to intercept Sijilak. Alsia did so, and managed to convince him that he should indeed become king. She wanted a great deal to become a queen. And besides, she honestly believed that Sijilak would make a wonderful ruler. So he went to his father the king and accepted his future regency. As a side effect of his sudden importance, he had to stay at the main palace, where Alsia could not train her dolphin. So he built a palace on the coast, which is today known as the Palace of Elmeaux, after Alsia’s dolphin. Eventually old King Oferte died, and Sijilak was proclaimed king. He decided with Alsia that their oldest daughter (they now had three) Venetiae should be ruler after him, as she was a smart and capable young girl. However, he had something of a problem on his hands almost right away. King Rebert, made overzealous for war by his scheming advisor Vaswe, had decided to attempt to take over the whole continent–which included Oriansia, King Sijilak’s country. King Sijilak was frozen. He had no idea what to do. When he received the news that King Rebert was attacking his eastern bases, he went to his room and stayed there, refusing to make any decisions. Queen Alsia, as usual, commanded the army and managed to stop Rebert’s first attack. She then rebuked her husband for “hiding away like a woman” in his room. Sijilak, while embarrassed, remained just as cowardly as ever. Later on King Rebert did manage to take Oriansia–while Queen Alsia was away in another country, writing a peace treaty. But King Rebert’s empire soon fell, and Oriansia was its own country again. By this time Alsia had a son who was just two years old. She named him Sneppe and convinced Venetiae, the heir to the throne, to allow Sneppe to become king instead of her when Sijilak died. Sijilak was not very excited about having a two-year-old inherit the throne, especially because he was weak and could die any time, but he dared not argue with his wife. King Sijilak died when little Sneppe was just five. Queen Alsia, knowing very well that this would happen, then became the regent, and would continue to be until Sneppe was nineteen. She managed to revive Oriansia after its trade had failed during Rebert’s brief reign. And she built a magnificent public building which is known as Alsia’s Hall today. It has a beautiful pattern of dolphins on the front, one of which looks exactly like Elmeaux. So Sijilak, despite the fact that he hated being a king (he said so several times to Queen Alsia), was important in Oriansia’s history. His son Sneppe captured a large strip of land that had previously belonged to their neighbor country Sengoria, and started up many industries that had never existed in Oriansia before. Plus Alsia was a major player in bringing Oriansia back to life after Rebert’s destructive reign. Even if he hated his job, Sijilak did well in the long run. Ghana Tovici lived around the time of King Amisos. Ghana Tovici had always been interested in alchemy–that mysterious art which was said to be able to both help people and destroy them. Her uncle was an alchemist and she could have easily become one too. Except Ghana was a girl. And in Tajmen, where she lived, girls did not have trades, except for things like weaving and sewing. She was expected to quietly marry the man her father chose for her, and then busy herself with running daily life for her family. Ghana was not going to stand for this. When her father picked out a boy that she was to marry, she disguised herself as a male teenager and ran away. At this her family immediately began a hunt for her–half malicious, half worried–that was to cause her a lot of trouble later on. Ghana knew that her uncle lived in Drec, a large city-state in the center of Tajmen. So she traveled there, only to be stopped by the gate guards. Why, they demanded, was she coming alone? Young people always came with a relative or friend. Ghana insisted that her name was Sombrue Songoe, she was a boy, and that she was an orphan going to live with her uncle. The guards didn’t exactly buy her story. But they did let her through. Ghana was a talented alchemist and was quickly conducting experiments much the way her uncle did. But Ghana was less interested in turning palm leaves to gold–she wanted to create medicines that would help people in the short run. Her greedier uncle continued to try to create gold, but he did help her with her medicinal studies. A little while later, an official named Luitican came to meet her and inquire about her alchemy. What exactly happened is not clear. But we know that somehow the fact that she was actually a young woman, not the man named Sombrue Songoe, was discovered. She then fled the country, supposedly afraid that her family would catch up with her. Ghana traveled first to the Geisel Isles, where she was rudely attacked by some wild seakitties, and after this went to Sengoria. Now if Luitican’s diary can be trusted, Ghana and Luitican staged this whole fleeing business on purpose. They knew that King Amisos of Sengoria was eager to accept scientists, alchemists, and medicine mixers into his kingdom, and also was quick to help anyone in trouble. So they figured that they could pretend that Ghana’s life was in danger and have her run to Sengoria, where she would probably be accepted into the court as an alchemist, and then could be a spy. A spy for the king of Drec, who now was on his toes regarding his relationship with Sengoria. King Amisos faced a dilemma. He writes in his book The Life of Amisosthat he had an “uncomfortable gut feeling” about Ghana Tovici. But he had just survived through an assassination plot, so he was understandably jumpy. Amisos accepted her into Sengoria and quickly gave her a place at court as the Minister of Alchemy (the second female minister in Sengoria’s history, the first being Ameratsu Qua-Feni, the Minister of Seakitties). Ghana was a very clever scientist. She was soon making observations about how chemicals reacted and created a theory of atoms, that while was mostly false, had a kernel of truth. She married a Sengorian man and had one daughter (who unfortunately died after accidentally dumping some acid on herself). She trained a few other people in alchemy and science. But all the while, she was watching. Just watching. Watching for anything that might be of use to the Drecish king. Luitican came to see her when she was thirty-five. He said that it was because he was interested in science and wanted some tutoring, but it was probably a secret spy conference, carefully arranged so that nobody would be listening in. At this time the king of Drec was beginning a war with another city, Sarchon – a war that looked like it might become a major deal. Luitican was interested in getting help from Amisos. Ghana Tovici was too careful. Amisos had an Ambassador of Tajmen, who, while he was fat, lazy, and selfish, was supposed to represent all the warring factions of the little island country. If she tried to get King Amisos to help Tajmen, she would not only get on the Ambassador’s bad side, but would also be dropping a hint to the fact that she was a spy. Ghana was getting lots of information that would be useful if the Drecish decided to attack Sengoria. She didn’t want to risk all the knowledge. A year later Ghana died suddenly in a laboratory accident. She was doing an experiment that involved a poisonous gas, but her tools for dealing with this gas were broken. The gas filled the room and she suffocated and died. A couple minutes later her husband came in, worried that her experiment was taking a long time. He, too, died from the gas, and it was lucky that a smart little handy maw-maw managed to open the window and air out the room, or else several other people might have died too. Was Ghana really a spy? Luitican says so. But we don’t really know. And we never will.